Fasten your seatbelts. Bumpy ride today, possibility of turbulence. Occasionally, I dream I can fly. And when I’m flying, without the aid of wings or jet-engine, I think to myself: this is easy. I simply have no idea what all the fuss was about. Somewhere in our unconscious, we feel flying should be effortless. Douglas Adams, Author of Hitch Hiker’s Guide to the Galaxy, sums up that so-near-and-yet-so-far feeling. In his universe, man has learnt how to fly; one simply aims at the ground and misses. It all depends on being distracted at just the right moment. In fact people could be hired to jump out at the right moment, just to help you get your feet off the ground for the first time. The moment something leaves the ground – where lift trounces gravity -it’s magically elusive. Woody Allan sums the whole thing up in his film ‘Sleeper’. The proprietor of the “Happy Carrot” health food store, he is sent to sleep and wakes up in the far future, revived to help rebels spy on a sinister state project. As soon as he is woken the soldiers in red are after him and he flees the house, stumbling upon a flying backpack. But it doesn’t work: he flaps his arms frantically as the soldiers advance, occasionally achieving something close to airborne status. He lifts for a few precious seconds and then his feet are having to do the work once again. “Goddam cheap Japanese flying packs…” he mutters through gritted teeth. Clever Allen. Homing in on a seminal moment, a transition for which man longs, the ultimate freedom. The perfect escape; not along, outpacing the enemy; not into the earth, hiding frm him; but upwards, outwitting the very ground on which we walk. There is a moment in Tolkein’s Hobbit which does the same in a very different way. And Tolkein has brought his readers from deep, deep underground the mountains, in the Goblins’ lair, with the wizard Gandalf, the dwarves and the small Hobbit, through almost insurmountable odds, to a moment when they have fled across land, pursued by the wargs, monstrous wolves. Finally they have fled up great tall pine trees. And the wargs alert the goblins, and the goblins set fire to the trees and stand back, laughing. And there are our heroes in a desperate state, certain to be burnt alive. Except that Tolkein brings in a perfect, serene, unexpected redemption. 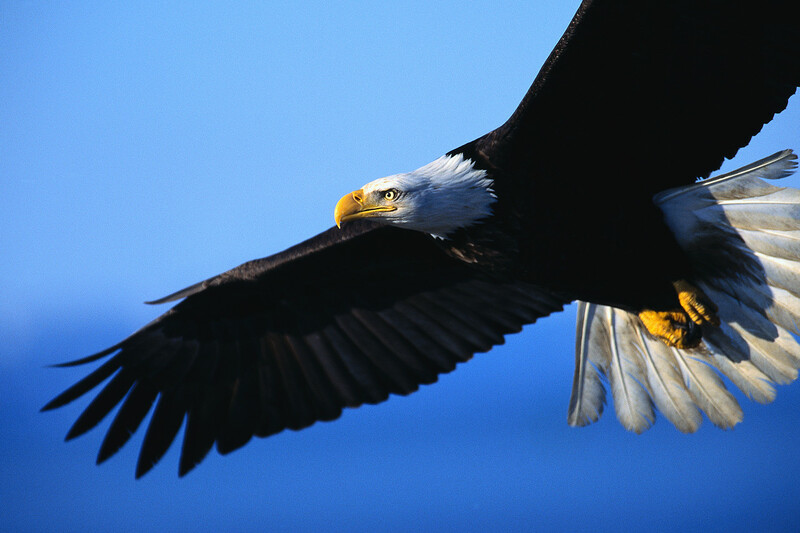 The great eagles live in the northern parts of the Misty Mountains, proud and strong and noble-hearted. And they look down at the goblins, creating fire and bringing mischief. And they swoop down to lift the band of adventurers away, away from that fiery maelstrom of hellish malevolence to a rocky outcrop, with a clear-sighted view of everything. And, as clearly as any storyteller can, Tolkien spells it out. Our longing to fly is a yearning to escape the shackles of all that is tawdry. Flight, in that scene of Tolkein’s, is freedom and life. Once you start looking, the longing is everywhere. And it goes back a long way: in 800BC a poet from Judah was promising those who trusted in their God would “soar on wings like eagles.” A Quran prophet brings miraculous redemption to the world by fashioning a bird out of clay and breathing life into it. Wings, to man, are a new beginning. A redemption. A chance to be the best you can be. And so today my wish for you is simple. This earth is a magical place. But just occasionally it becomes too much. It begins to feel burdensome. Whatever binds you to this globe’s surface, and keeps your feet earthed in clay, may it lose its power to hold you back. And may you discover your eagles wings. And fly; without the aid of any goddam cheap Japanese flying packs. Posted in WhimsyTagged Douglas Adams, flying, Hitchhikers Guide To The Galaxy, The Hobbit, Tolkien, wingsBookmark the permalink. A wish for us all, fly free. It’s wonderful being above it all, isn’t it? If you fly with ease in your dreams, enjoying the landscape, it is suggested that you have risen above things and gained a new and different perspective. However, if you have difficulties staying in flight the opposite is true. I fly frequently, Kate, and every time it’s different… but always fun… and always free! Enjoy your flying! Wonderful to soar above the clouds but the fear of crashing so often outweighs the joy. We’re a funny lot – desperate to be safe when that’s the one thing that we cannot be. Indeed. We are walking contradictions, Roger. I think you’re right about needing to embrace walking, IE. But I think it does not make the secret wish many humans hold beneath the surface any less pressing. The yearn to fly, and the equation with freedom and redemption, sits there in our collective unconscious like a fairy tale. Love Woody Allen, the vid is so funny, especially the orb at the end. He is hilarious, Lou. I do love Sleeper. Splendid post, Kate. On Valentine’s Day, whilst driving along my little road, a pair of hawks were aloft, doing their mating waltz. A beautiful sight I never tire of seeing. I thought they had found just the right day to celebrate the day. Oh, Penny, how amazing! I do loved watching hawks doing their thing. We have lots of red kites around here, following the Thames and the other rivers. And they pair up and soar. Wonderful. Teleporting would be amazing, Carrie! I do wonder what it would do for our pace of life, though. Transportation has made it possible for us to go half way round the world in a matter of a day. Would teleportation make us try to fit even more in to our schedules? 🙂 How lovey to be the think one thinks about when gardening, Debra: my mind roams all over the place when I am there with all my plants. It is very close to heaven. At a hotel in Clearwater Beach . . . guests can fly over the gulf of mexico wearing Jet Packs. Nancy, these are genius 🙂 Very Woody Allan. I love it Kate! You know back in 1960 we believed that by the turn of the century every one would fly with little power packs and cars would not exist. The more I learn about the power of the human mind and limiting perception I actually think someday free flight might be possible. No point in discussing Newton’s Theory. That was one perception and limiting in its conclusion. I do wish I had been young in the era of hanggliders and paragliders. As it is, I have made do with microlight flight. Have you flown one, Col? For a short but blissful period a couple of years ago. I even navigated back to the strip unaided. It is wonderful – the only thing I wished for was a silent engine. Early Hornet Moth flying helped, and I found it similar to helming a yacht in the subtlety of movement needed to turn and bank or go up and down. You certainly should have a go. Ask for a training flight rather than a flip. Pingback: today. « Sick with Poetry. I flew today. The garden airplane variety. Still, it’s always a little thrill to breach the clouds. It’s that way in real life, too, when I lick a problem. Strange how we humans equate the two, unfailingly, Andra. Cheers Kate – just had a boiled egg for breakfast and now taxiing out of bed! Brilliant post! To rise up on wings like eagles is exactly what motivated me to go hang-gliding one year for my birthday. Absolutely nothing like it. To feel yourself lifted up by thermals that are so powerful, yet invisible … truly a dream come true. Wow, Hope, that’s one way to experience it! What a fantastic project! I have occasionally had dreams about flying, not often, but when I do, it’s felt great. Sleeper is one of my favorite early Woody Allen films. It’s brilliant comedy. I loved the orb and the orgasmatron. It is wall-to-wall laughs, Lame; and if ever I’m feeling glum a quick viewing can get me back on my feet again. Another of my favorite early Woody films is “Take the Money and Run”. It’s pure idiocy, but it still works. Of his infinitely more sophisticated work, “Manhattan” is my absolute favorite — even more so than “Annie Hall”, which I love, too, but when I saw “Manhattan” that sealed the deal for me to move here. I happen to live in a brownstone that’s a few doors up from where Gershwin resided back in the day. I fly to get somewhere, but walk to understand. Feeling a little ‘misunderstood’ of late. This helped. Thanks.